As we drove through the mountains, I saw green trees and yellow wildflowers beneath a bright blue sky. What a difference from the scenery my three friends Jackson, Tristan, Amelia and I were used to when headed to Stowe, Vermont. and Black Cap Coffee & Beer) had me excited. Not to mention, we were looking forward to getting back into the action on the mountain—on two wheels this time. We’d come to see what people had told us for ourselves: Stowe is more than just a destination for skiing. 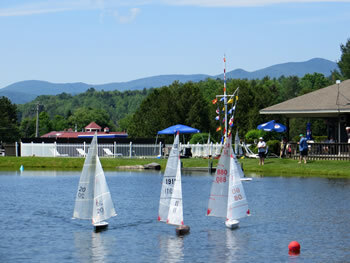 We had made reservations on the south side of the village at the Commodores Inn. We’d never stayed here before, but it offered plenty of perks. 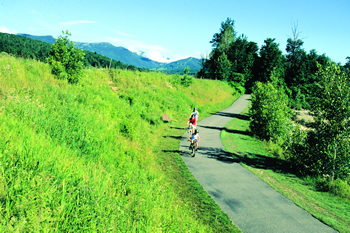 For one thing, the inn is near Stowe’s network of marked mountain biking trails (more than 50 miles all together). As soon as we walked in the door, we were greeted with offers of lemonade and fresh-baked cookies, which we sipped and munched on while the staff chatted with us about the trails we wanted to try. We immediately felt at home.We roamed around the inn for a bit, passing by an indoor pool, outdoor pool, a few hot tubs, and a restaurant and bar. What really caught our eyes, though, was the small (I’d guess about three acres), unbelievably blue lake behind the restaurant, where we found something unexpected: a group of locals racing remote-controlled model yachts. Yes, yachts! yes, please! I thought my fingers would be nimble and primed from my hours of XBOX, but the steering proved to be a learning curve. I managed not to maroon my ship, so all things considered, I’d say I was a decent captain. With a whole afternoon ahead of us, we piled into the car and drove up Mountain Road to do what we came here to do: bike one of Vermont’s most popular mountain bike networks. We headed to the Cady Hill Forest, one of the best-known trail hubs in the area for mountain biking. As we looped through the forest, it felt like the green leaves were wrapping around us, coaxing us further into the woods. The smell of wildflowers drifted through the air as we rode slowly, making sure to stay to the side in case anyone wanted to pass us, but no one seemed to mind that we were taking our time. We hadn’t been on this trail before and wanted to experience every moment of it. The further we rode, the more we discovered: wildlife, other trails and a pair of friendly locals on a green chair—a double ski lift chair, to be exact. It certainly wasn’t what we expected to find, so we had to stop for a closer look. Hanging from a tree, it looked out over the forest and gave a peak-a-view of the ski mountain. The locals already sitting in it with feet dangling were happy to turn toward us to give us the scoop on other trails. As one of them told us about Adams Camp trails, I noticed her legs started to swing a bit faster, as if they were remembering the excitement of the ride. She told us we should definitely check it out before trip’s end. When we returned to the car around 6 p.m., I realized we could have easily biked all day without riding the same trail twice, which made me want to explore even more. But, our empty stomachs were calling louder than the trails. Having burned a lot of calories with our riding, we were decidedly hungry and went for a drive up Mountain Road to find a place to eat. About a mile from the trailhead was Piecasso Pizzeria & Lounge. I Yelp-ed it on my phone, and reading the reviews about its pizza and pasta left no need for further discussion. When the hostess seated us at a table in the bar area, we immediately knew we had found a local hangout. People were walking around the restaurant, sitting at the bar, chatting with friends and family, while kids roamed in between them. The staff didn’t mind—neither did we. There was even a game room for the kids to play in while their parents ate and chatted with friends. It reminded me of the homegrown pizzeria in the small city I’m from, with the family-friendly vibe that is hard to come by. It made the restaurant and food taste like home. We overheard some other 20-somethings at the bar talking about mountain biking, so we introduced ourselves while we waited for our drinks. They soon joined us at our table and were even nice enough to order silly bread for the group. 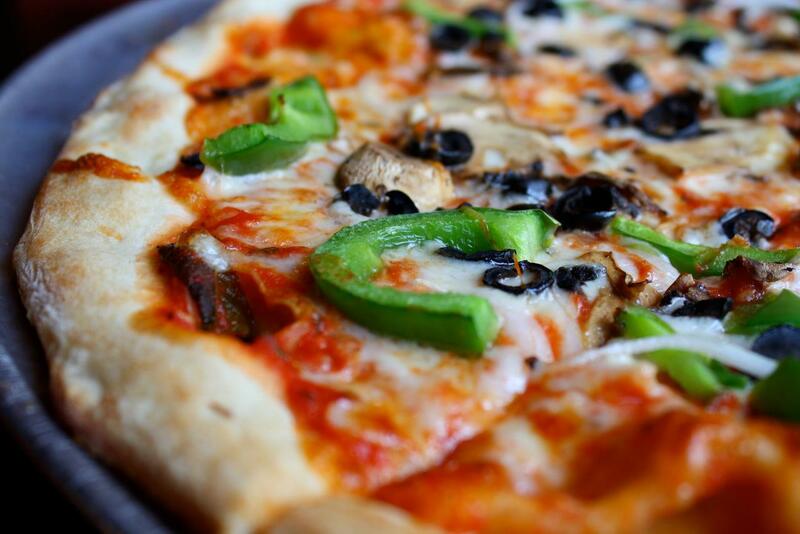 Served with marinara sauce, seasoned like a breadstick and cut in the shape of a pizza, the taste gave us a good reason to look forward to our create-your-own personal pizzas with hand-tossed thin crust. I ordered mine topped with white sauce, broccoli and chicken. It was the perfect combo of creamy and savory. I also tried a piece of Tristan’s personal version of The Carcass, which—as the name suggests—had loads of meat, including bacon, ham, meatballs and pepperoni, with extra mozzarella. It was Tristan’s carnivore dream! We drove back to the inn that night (with some boxed-up slices in the backseat for tomorrow’s lunch), excited to wake up to another day in Stowe. 10:30 a.m. the next morning, we went to a familiar hangout for some caffeine. It was the same great coffee shop from winters before, but to our surprise, it had a new name. 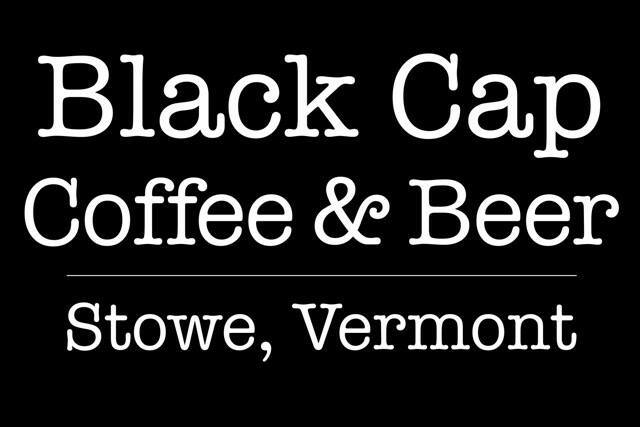 No longer just Black Cap Coffee, it was now called Black Cap Coffee & Beer. Beer?! We entered curious. The café was bustling with people placing orders for their morning coffee. And there, in the back of the café, was a beer shop! As we stood in line, I remembered the hot French Kiss latte I had here last winter—sweet and comforting on a cold day—and I wondered if the combination of white chocolate, vanilla and caramel would taste just as good iced. I ordered it, and yep, made to perfection and just as delicious. We sat on the same comfy couch by the window as last time, where we could talk and savor our iced lattes with a view of the village. Between each sip, my eyes wandered back over to the beer selection as well as the paintings of cows, birds, horses and landscapes that were for sale overhead. 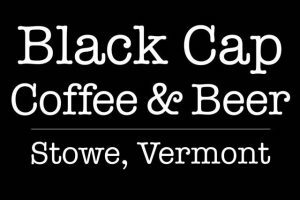 Black Cap Coffee & Beer had, without a doubt, a Vermont charm that I had come to know and love, mixed with a hip coffee-house vibe. We easily settled into the place and our conversation, hanging out and catching up just like we did every time before. Before heading out, we perused Black Cap’s expansive collection of local, regional and exotic beer. We carefully made a few selections and bought them to enjoy lakeside later at our hotel. We snuggled the beer in our cooler with last night’s pizza and were soon off to the trails again—ready for the next mile, the next uphill climb and our next Stowe adventure.